Do you have what it takes to hit a hole-in-one and win a new car or $10,000? Try your skill, or your luck, at the 2018 IHS Golf Outing on Wednesday, September 19 at Richter Park in Danbury. As part of the event, golfers who shoot a hole-in-one on hole 3 can win a brand new 2019 Chevrolet Equinox, sponsored by Ingersoll Auto of Danbury; a hole-in-one on hole 13 wins you $10,000, sponsored by CironeFriedberg, LLP, the Bethel-based CPA firm. 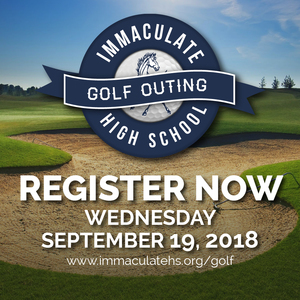 All proceeds from the golf outing benefit IHS students and school programs.To reserve your spot and/or sponsor the IHS Golf Outing on September 19, go to www.immaculatehs.org/golf.